Many, many heartfelt thanks to all of you for visiting! I so enjoyed your kind notes. I know the new pieces will be very happy in their new homes. Please send me an email with your intentions to purchase. List item number and method of payment. PayPal (I will invoice you), checks and money orders. 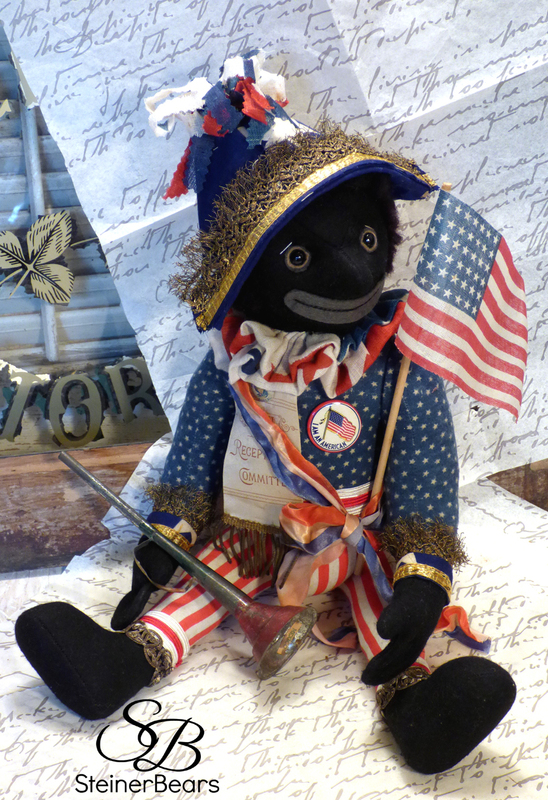 A sweet 11" patriotic chap created in soft, hand dyed light gray mohair. 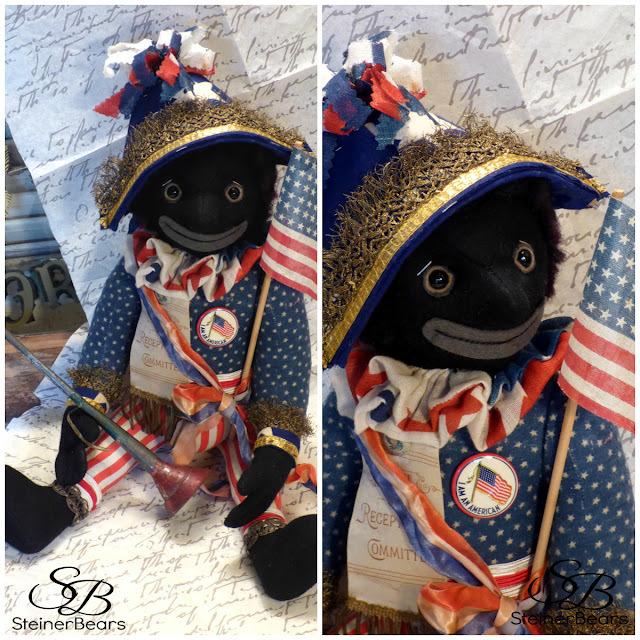 He has antique shoe button eyes, is fully jointed and stuffed loosely with poly-fill and excelsior. His pads are aged linen over wool felt. Harry has been gently aged. 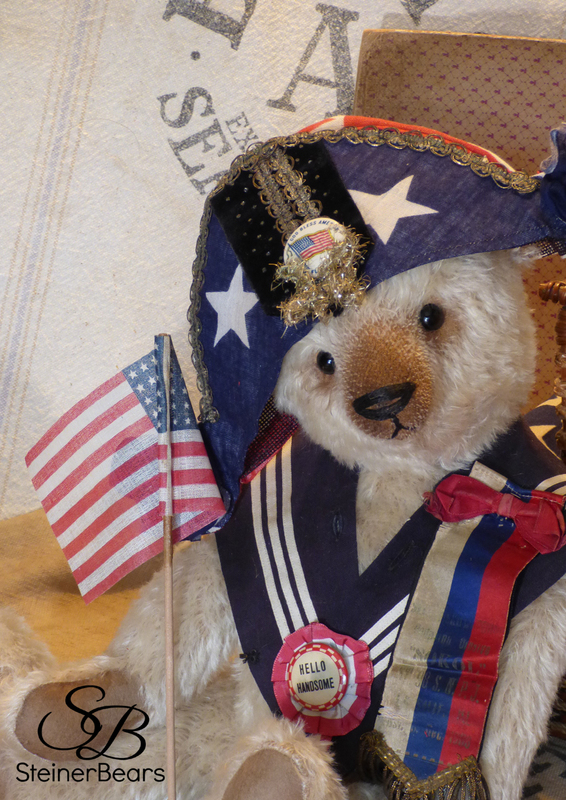 Harry waves an antique flag and is adorned with a vintage ribbon, pin back and bunting ruff. 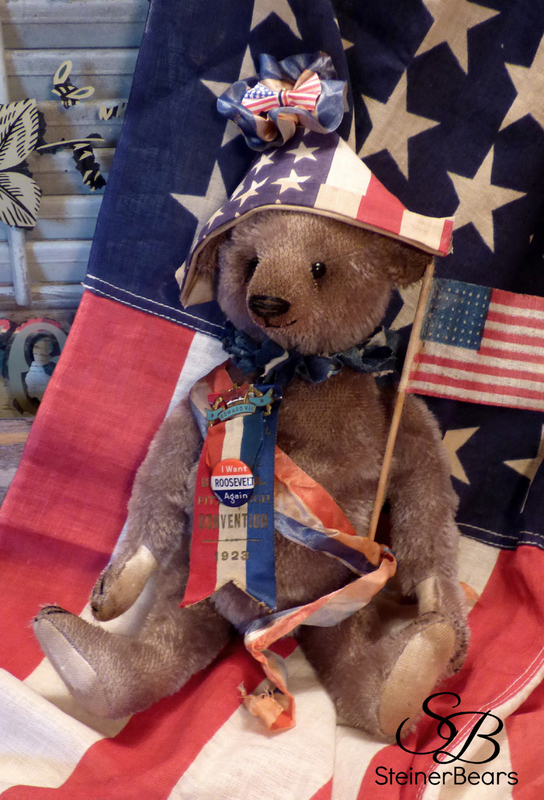 A hat created with antique flag bunting frames his sweet face. 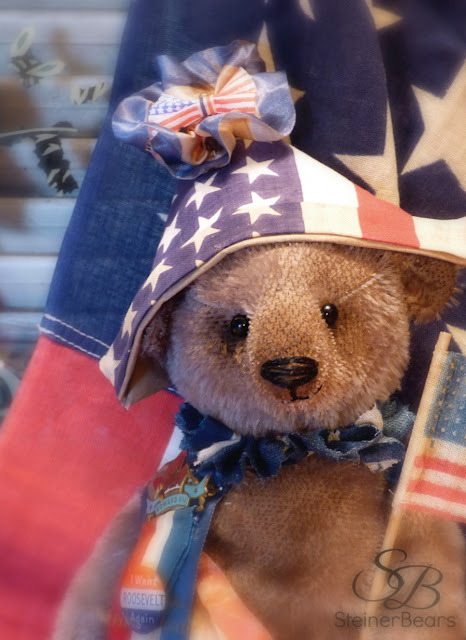 Teddy bears best friend is joining in on summertime fun. I love this charming fellow! button eyes and hand tufted wool roving hair. pin-back and holds a vintage metal patriotic horn. This charmer is ready to celebrate! 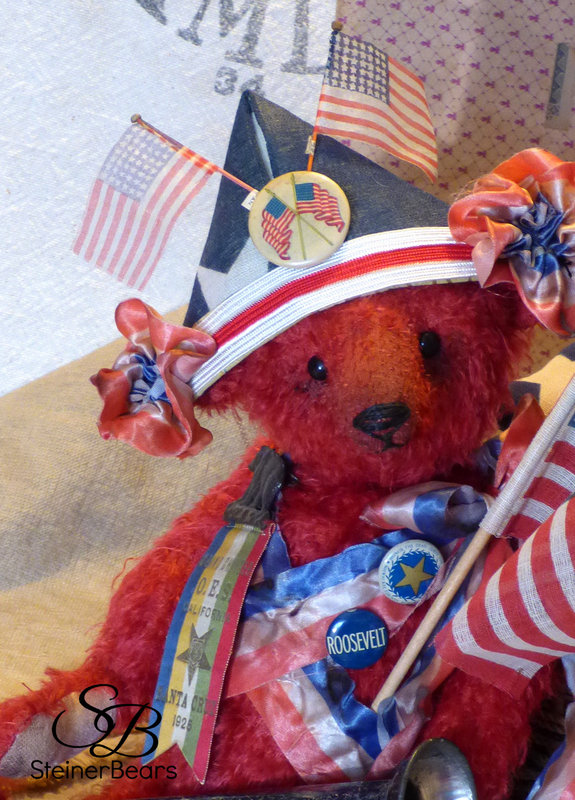 A very patriotic little fellow created in scarlet red mohair. He's embellished with silky ribbon, vintage pinbacks and a vintage convention ribbon badge. 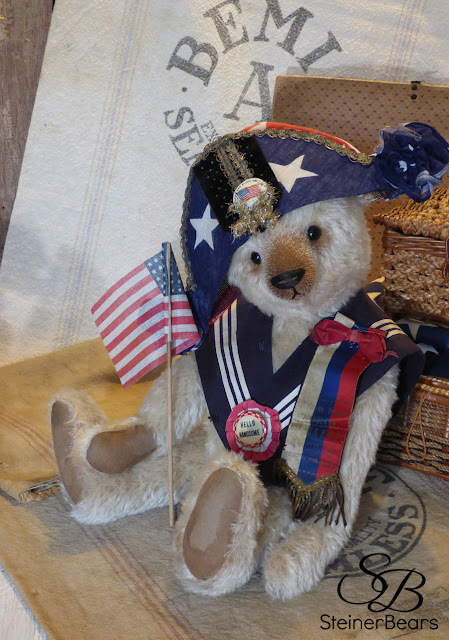 His sweet smiling face is framed with a hand made hat made from antique bunting and embellished with vintage silk flags and pinback. 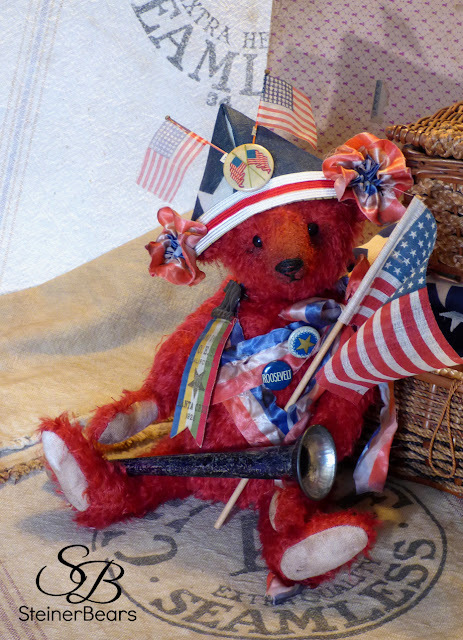 As he waits eagerly for the parade, he waves a vintage flag and holds an old blue metal horn. Oh my, what a charmer this one is! The girl teds will surely swoon. Sailor boy is created is soft ivory mohair with hand shaded facial accents. Adorably attired, wearing a vintage sailor collar, embellished with a vintage ribbon and pinback. His beautiful face is framed by a hand made hat created from vintage bunting, ribbons and old trim. He carries a vintage flag.